The 21st Century city is at an existential crossroads. The resurgence of urban living has resulted in new open spaces, less crime, more transit options, and invigorated local stewardship, but it has also exacerbated traffic congestion, created housing shortages, and increased geographic inequality and vulnerability to disaster — both natural and man-made. To remain competitive, cities must address these challenges, and do so in an environment of increasingly complex regulations and constrained resources. As a response, one of the most compelling developments in urban design has been the explosion of interim “quick build” interventions to experiment with and expedite mobility and placemaking solutions for the public realm. 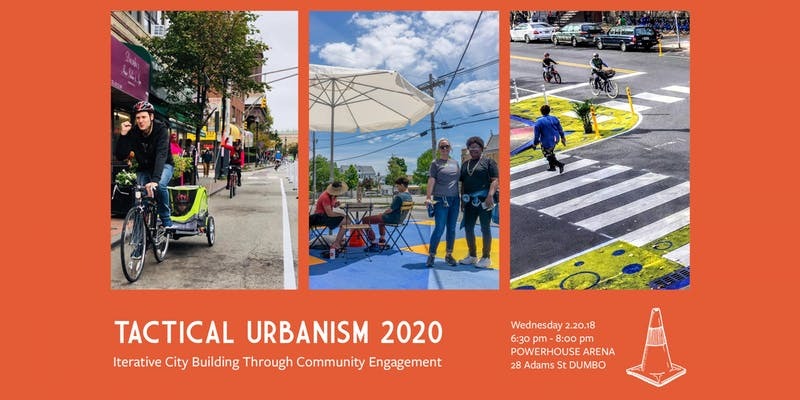 In this lecture, Street Plans co-founder Mike Lydon will highlight some relevant projects and emerging trends from around the globe in the years since he co-authored Tactical Urbanism: Short-term Action for Long-term Change (Island Press, 2015). Mike will also preview content from the forthcoming releases of two digital publications: Fast-Tracked: A Tactical Transit Study, and the Tactical Urbanist’s Guide to Materials and Design Vol. 2. Finally, the presentation will conclude with a discussion about opportunities for New York City government agencies, private developers, BIDs, and neighborhood groups to employ similar tactics for executing public realm projects with greater speed, effectiveness, and community involvement.